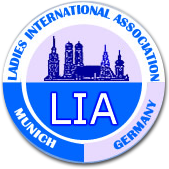 The Ladies’ International Association (LIA) Munich was founded in 1994 by a group of international ladies who recognized that becoming comfortable in a new environment is easier within a group of like-minded individuals. LIA's aim as a non-profit, non-political, non-religious, non-commercial club is to provide opportunities for members of various nationalities to meet and to participate in social, cultural, linguistic and philanthropic activities. The club is affiliated with an international network of Women’s Associations called “Open Door”. The LIA is run by members for members. Being active, sharing your know-how and participating in activities is considered important for the club. The Executive Board, consisting of 5 members, is elected annually and together with the Activity Coordinators ensure that there are a variety of (mainly) daytime activities during each month of the year. LIA issues a digital monthly newsletter including a programme with upcoming club events. *Any links to other sites are provided only as convenience to the users of this site. LIA is not responsible for the content of such sites and shall not be liable for any damages arising from that link.